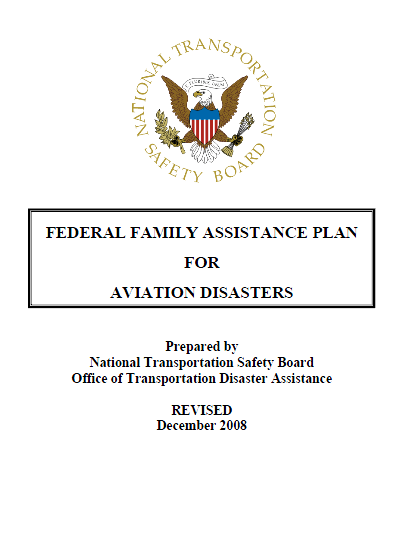 This plan, which is designed to serve as guidance, assigns responsibilities and describes how air carriers and Federal agencies should respond to an aviation accident involving a significant number of passenger fatalities and/or injuries. Organizations given authority or responsibility by legislation should develop procedures specific to their role. Supporting legislation is located in appendix A. This plan pertains to any domestic or foreign commercial aviation accidents occurring within the United States, its territories, possessions, and territorial seas. 1. The Chairman of the NTSB will request Federal agencies to support the NTSB in accordance with the references included in appendix A. 2. Pursuant to the Aviation Disaster Family Assistance Act of 1996, the NTSB has the primary Federal responsibility for facilitating victim recovery and identification. It is understood that the presiding medical examiner or coroner is legally responsible for victim recovery and identification. (It is noted that there are differences between a medical examiner and coroner. For the purposes of this document, the term “medical examiner” is used interchangeably with “coroner.”) To ensure adequate resources for medical examiners to accomplish their jurisdictional responsibilities, the NTSB coordinates the resources of various Federal agencies to effect victim recovery and identification. The NTSB supports the use of State and local mass fatality teams and other trained experience personnel under the direction of the medical examiner. 3. For purposes of this document, the terms “family,” “family members,” “friends,” and “relatives” are used to refer to those people who have a relationship to a person involved in the accident. Although these terms have slightly different meanings, they are used interchangeably throughout the document. 4. Large numbers of family members of those killed in the accident will travel to the city closest to the accident and will utilize the accommodations provided by the air carrier. Other family members will remain at their local residences. 5. Most, if not all, families of those seriously injured will travel to where the injured are hospitalized; once the injured are released from the hospital, these family members and the injured will return home. 6. Implementation of this plan assumes that the accident will occur in a geographical area where the resources described above are available. Air carriers operating equipment over remote areas (for instance, Alaska) should contact NTSB TDA about modifications needed for accident response in those locations. 1. Notify family members of victims involved in the aviation accident based on manifest documents and other available information. 2. Monitor search and recovery operations, and offer assistance as needed. 3. Determine the status and location of injured victims. 4. Obtain approval of the local medical examiner for Federal assistance (for instance, the Disaster Mortuary Operational Response Team [DMORT]) to assist in the identification of fatalities and the notification of their families. 5. Provide crisis intervention, logistical support, and services to victims and their family members. 6. Provide daily briefings to families on the progress of recovery efforts, identification of victims, the investigation, and other areas of concern. 7. Arrange for a memorial service, if desired by families. 8. Provide for the return of personal effects. 9. Maintain contact with victims and their families to provide continuous updates regarding the progress of the investigation and other related matters, both at the accident location and once the families have returned home. What is the role of the U.S. State Department during an aviation disaster (domestic or foreign air carrier) in the United States or its territories? The U.S. Department of State is responsible for providing official notification to foreign governments whose citizens were involved in the accident. Notifications take place after necessary information about foreign passengers is obtained from the air carrier. The State Department can also assist the air carrier in notifying U.S. citizens who may reside or are traveling outside the United States that a member of their family has been involved in an aviation accident. For foreign carriers, the State Department can assist by alerting the U.S. Citizenship and Immigration Services (USCIS) that a corporate “Go Team” is en route to the accident city. They can assist with obtaining required visas or other documents needed to gain entry into the United States. Assistance can also be given to family members en route to the accident city. The State Department will work with USCIS to ensure that entry into the United States by these families is done in a timely, compassionate, and professional manner.